I took knishes, kasha, Mrs. Stahl's, and my grandmother for granted; then they were gone. Laura Silver is a woman on a mission. When her favorite knish bakery, Mrs. Stahl’s, closed, she embarked on a round-the-world quest for the origins and modern-day manifestations of the knish that would take her from Brighton Beach to Jersey and across three continents. 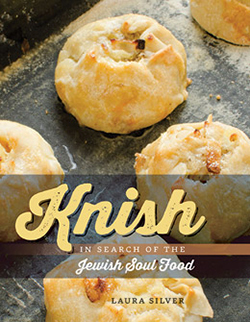 Her forthcoming book about her journey, Knish: In Search of the Jewish Soul Food, will be available from Brandeis University Press on May 6, 2014. In this excerpt, we meet, and lose, Mrs. Stahl’s and Fritzie Silver, the author’s grandmother. The knish situation in Brooklyn is not what it once was. I can say that because I’m third-generation Brooklyn, once removed. 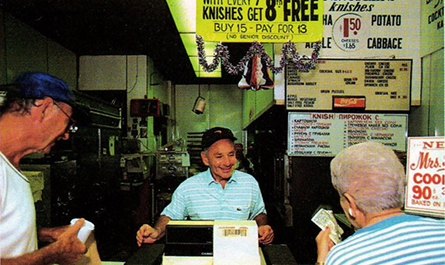 Queens, where I was born, had knishes, too, tons of them. I took them for granted, then they were gone. More than latkes, matzoh, or the apple-and-walnut charoset that crowned the seder plate, knishes were my family’s religion. For knishes, we went on pilgrimages. For knishes, we traversed Long Island, top to bottom, from northern Queens to southern Brooklyn. For knishes, we drove Northern Boulevard to the Grand Central, past LaGuardia to the BQE, through to the Prospect Expressway, which deposited us on Ocean Parkway amid old trees and religious Jews, a straight shot to Mrs. Stahl’s. A knish is a pillow of filling tucked into a skin of dough. The ones at Mrs. Stahl’s were baked round mounds, each plump with a stuffing, savory or sweet. 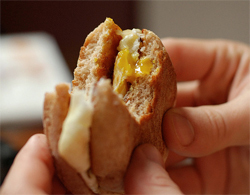 Each piece — the size of a fist or just bigger — revealed a hint of filling on the top, a bald spot, as if for a yarmulke. But the real secret to the construction of a Mrs. Stahl’s knish remained hidden: Yet if you cut the knish in half, the cross-section revealed a membrane of dough that split the innards into chambers, like those of the human heart. We harbored them in our freezer. We ushered them to the toaster oven and moved magazines and newspapers to welcome them to the Saturday afternoon table. In the 1980s, my native Flushing, Queens, was a haven for grandmother- and grandfather-types who had survived pogroms or the Holocaust. Like them, we frequented bakeries and delis of the Jewish persuasion. But to visit our own forebears, we had to go elsewhere. Brooklyn was the Old Country, where kids once played in the street, flicked nickels onto corner-store counters, and maintained an allegiance to “the block.” To hear my father, a native of Flatbush, tell it, in those days five cents could get you a hollow pink rubber ball called a Spaldeen — or a knish thick with liver. When there was traffic, we abandoned the highway in favor of so-called shortcuts. We locked every door, turned up the jazz on the car radio, and zigzagged through hollowed-out neighborhoods that made his old neighborhood look luxurious. After decades in a dark apartment on Rugby Road, my grandmother landed a spot in senior housing, left Flatbush, and moved to Brighton Beach. As a young woman she’d had a bungalow there, but this was better. Her place overlooked the ocean and sunsets and provided incredible proximity to Mrs. Stahl’s. The mythic knish maker and Gramma Fritzie were nearly synonymous. After college, I moved to Brooklyn, five miles from both of them. Every other week I delivered: a piping-hot kasha and a half-dozen frozens. Anyone who entered apartment 12A — visitors, and, eventually, home health aides — was offered a knish, split, heated, and served with extra grainy mustard, homemade by my dad. The day she died, we didn’t eat knishes — or anything. It was the tenth of Tishrei in the year 5758 on the Hebrew calendar, in other words, October 11, 1997, which coincided with Yom Kippur, the Day of Atonement and fasting. Her body was still in the bedroom. As per New York City protocol, a cop came to the house. “Yes, of course I was here at the time of death,” I lied, to appease the policeman — and myself — and avoid further inquiry. It never occurred to me that my grandmother could die without me. Angie, the home health aide, had summoned us in the morning. But since — wink, wink — a family member had been on the premises, there was no need to invite further investigation. We divvied up adult diapers, sorted books, and used newspaper to cradle dishes. I’d like to say knishes were stashed in her freezer, but the truth is, I can’t remember. After that, I swore off the neighborhood. On the first anniversary of my grandmother’s death, we drove east, an hour to the cemetery, for the unveiling. This custom, prominent even among the nonobservant, concludes a year of mourning. We draped a piece of muslin on the gravestone, taped it in place, and ripped it off in one fell swoop. From a page that the rabbi sent, we recited El Maleh Rachamim, a prayer for the departed whose title addresses the “exalted compassionate Almighty.” Uncle Mitch, who, technically, is not my uncle, chanted the prayer in Hebrew, which made it legitimate. O, God, full of compassion, Thou who dwellest on high, grant perfect rest beneath the shelter of Thy divine presence among the holy and pure who shine as the brightness of the firmament to the soul of our beloved Fritzie Silver who has gone to her eternal home. If my grandmother’s soul had indeed journeyed to its eternal resting place, I was fairly certain it was not the manicured lawns of Beth Israel Cemetery in Farmingdale, Long Island. Her spirit remained embedded in the boardwalk at Brighton with its creaky slats, cloaked Russians, and diehard aficionados of the knish. Waves hummed with nothingness; the sky languished and the whine of seagulls turned incessant. No savory pastry could console me. I kept my distance. Two years after my grandmother’s death, I felt the pull of Mrs. Stahl’s. October 5760 came thick with wistfulness, downed leaves, and heaving winds. The High Holidays smudged the landscape with reminders to take stock, attempt atonement, and make friends with mortality. The Days of Awe, as they are also called, nudged me toward the beach. The sky reigned blue upon blue. Beneath the elevated train at Coney Island and Brighton Beach avenues, the windows of Mrs. Stahl’s remained opaque with steam. Like my grandmother in her last months, the shop showed evidence of decline. The counter that once dispensed cherry lime rickeys had morphed into a steam table bogged down with stews and purées. 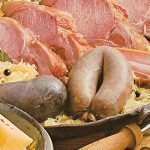 The place blanketed itself in a meat smell. Behind the counter, a cone of lamb lurked on a vertical pole. I wanted a hug. In the far corner, a woman with short dark hair attended to customers and knishes. Beige cap, thick glasses, and matter-of-fact manner, she was the only version of Mrs. Stahl I had ever known. I recognized her, of course, and hoped she would welcome me back, ask after my family, or remember my grandmother. (She was sustained on Mrs. Stahl’s but rarely crossed its threshold.) The woman behind the counter — I never knew her name — didn’t realize she had become a stand-in, first for Mrs. Stahl and then for my grandmother, who was similar in height and build. Gramma was not a baker or a maker of knishes, but she was a discerning connoisseur who knew better than to place a knish in a microwave. The Incarnation of Mrs. Stahl shuffled behind the counter. She plucked knishes from the freezer, stationed them in the warming drawer, and bagged them for orders. She rang them up, took cash, and made change, all without small talk. I stood hollow and conspicuous, like a bright yellow squirt bottle with one last dollop of mustard lodged in its entrails. I had anticipated a momentous return to Mrs. Stahl’s, but on that visit I lingered in anonymity. I was just another customer. And, as I discovered after I placed my order, a customer who had forgotten her wallet. Probably it was just as well that the Incarnation of Mrs. Stahl did not remember me. She prepared my order — grabbed it, bagged it, and put a lid on the tea. I left to scrounge for change in the car. The ancient Volvo sunned itself, nose-in, in a parking spot alongside the former site of the Brighton Beach Baths (where, as a kid, my dad had a locker). By then, the urban country club of the middle class was on the verge of its own transition: condos. I would never look down on the tidy brick-balconied buildings from my grandmother’s apartment, and I was glad she wouldn’t either. The glove compartment disgorged three dollars in quarters, just enough, in 1999, for one kasha knish and one tea with milk. Judaism is big on intuition passed down through the ages. It’s stuffed with guidelines and injunctions and rules, relayed, at least originally, in Hebrew and Aramaic. I knew a few from Hebrew school — honor your parents, keep the Sabbath, don’t eat McDonald’s — but found them cryptic and tricky. A knish required no interpretation or unfurling. I could embrace it with hands, lips, fingers, and though I never noticed, heart. I understood its age-old secrets and sacred traditions. In the presence of a knish, all that was awkward dissipated. The Torah, holy book of the Jews, is stored in a holy ark — not like the boat Noah used to rescue animals, but more like an armoire. On holidays and the Sabbath, the ark is opened, the Torah is cradled and paraded through synagogue aisles. We kiss it. On Yom Kippur, when the doors of the divine armoire are opened, it is said that human prayers get a straight shot to the Almighty. Twice I have paid dues to a synagogue, but never really felt I belonged. Once, in the basement room of a place that welcomed nonmembers for free on the High Holidays, I lined up to pray before the ark. The anticipation held holiness and awe, but when I came breast-to-breast with the Torah, I stood clueless and mute. My grandmother, who had been to synagogue as a young woman, encouraged me to drop in now and then, mostly for the social aspects. With the exception of a Hebrew naming (my mother’s mother, Nana, had whisked me to her rabbi, down the block, in the Bronx) and a bat mitzvah (which I initiated), I grew up on the outskirts of Jewish life. I was largely unschooled, but curious enough to migrate to shul when it suited me. The night my grandmother died, I stood five miles from her bedside, in synagogue, fist to chest in confession, with a collective of strangers. But when the Incarnation of Mrs. Stahl pulled one kasha from the warming drawer, the smell enveloped me. Nose-to-nose with the inner knish sanctum, I exhaled, as if sitting on the Jennifer Convertibles sofa bed at my grandma’s house. I exhaled and drew comfort from the list of knishes suspended from the ceiling. We — my grandmother, my father, my mother, all of us — preferred kasha. It means buckwheat groats, but there was no need to translate. Kasha was simply kasha: beige, fluffy, earth-smelling kernels destined to fill knishes, plates, and stomachs. We deigned to nosh other savory flavors: potato (our collective second choice) and things mixed with potato. Sweet cheese knishes sat flatter and rectangular, easy to mistake for wide-load blintzes plumped with fruit fillings — strawberry, blueberry, or cherry — that mingled with farmer cheese. Just before Thanksgiving, my knish supply had dwindled. That was 2005, a Saturday. The weather shone clear and crisp; I took Ocean Parkway to Mrs. Stahl’s. Families strolled the boulevard in their finery; I pedaled in ripped jeans. At Brighton, women with stand-up shopping carts bargained in Russian. “No Parking” signs tilted slightly. I listened for Russian expressions I could decipher: Da. Nyet. Pajalsta. Priviet. Khorosho. Then I noticed: Mrs. Stahl’s storefront was adorned in plastic flags — a grand opening. This was a closing of the highest order. 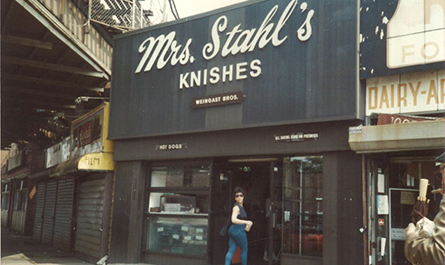 After seventy years beneath the elevated subway, Mrs. Stahl’s knish shop had become a Subway. 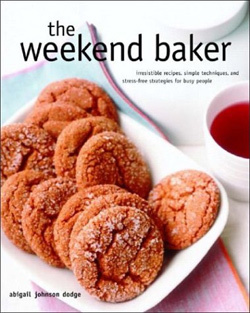 Laura Silver is an award-winning journalist whose writing on food and culture has appeared in the New York Times, the Forward and on NPR. Laura has been a writer in residence at the Millay Colony, the Banff Centre, and the New York Public Library. She is considered the world’s leading expert on the knish.